It cannot be found in fear, anger or when overwhelmed. Hope must be cared for. It has to be nurtured and fed yummy treats. Hope needs love and trust to grow. Many people give up on hope because they are told it is not realistic and they need to face reality. Do you prefer living with hope or without it? This photograph is what Emma chose to represent hope. 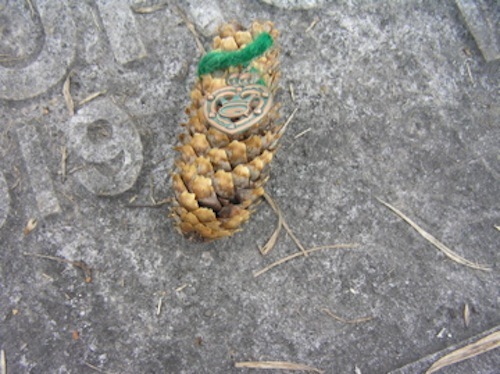 It is a pine cone with a metal heart, resting atop her great grandfather’s tombstone. This entry was posted in communication, fear, hope and tagged Anger, Autism, autistic, fear, Finding Hope, hope, love, overwhelm, Parenting, reality, Trust. Bookmark the permalink. Beautiful Isabel. Thank you for sharing Lenny’s words. I prefer to be hopeful as well, Emma. Sometimes the nitty-gritty of day-to-day living makes us lose track of it but I appreciate the fact that you reminded us so beautifully! Do keep sharing your thoughts, Emma! Pine cones are so full of the seeds of new life. You’re so amazing Emma to link that symbol with your ancestors. We all need their blessings to keep the seeds of hope alive even in the darkest moments. Seeds root in the dark and head for the light. You Emma, and Noah and all your tribe are kin to the angels…keep blessing us…thank you for your patience when we forget, judge, and lessen hope. Beautiful Emma! I always leave here with something to think about, whether the words are yours or your mom’s. Thanks for sharing! I prefer to be hopeful too. But today hasn’t been a nice day so I needed reminding. Great poem Emma. I prefer to be hopeful as well I don’t know how hopeless people get through life. Lovely words, Emma. Hope is indeed highly important to life. For what is life without hope? Dreary and depressing. No one wants that. (No one sane, at least! 🙂 ) No, hope is a good thing, and keeps us going in the dark of night. It’s a lovely photo as well – I thought so even before I read the caption detailing what it was and where it was located. 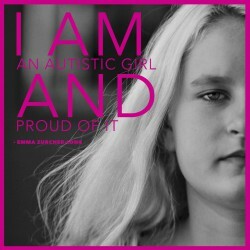 Thank you so much for sharing this, Emma. I certainly prefer to life with hope than without it. I agree that hope can’t be found in fear or anger, but often is found in love and understanding.